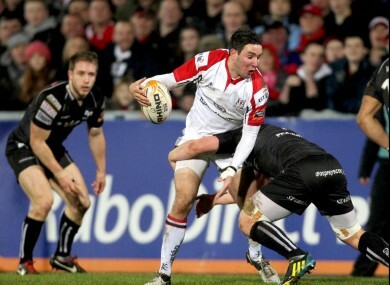 The Ulster centre ruptured his ACL in Friday night’s Pro12 defeat. ULSTER CENTRE PADDY Wallace will miss the rest of the season after his province confirmed he suffered a ruptured anterior cruciate ligament in his left knee. “This injury will require surgery and a significant period of rehabilitation.” The province says. Wallace is now added to a lengthy injury list including Stephen Ferris, Chris Henry, Nick Williams and Tommy Bowe as the province look to rediscover some of the form which propelled them to the top of the Pro12 and through the pool stage of the Heineken Cup in the first half of the season. With a trip to Twickenham in store for the Heineken Cup quarter final against Saracens on April 6; the absence of Wallace will add more onus onto 21-year-old Luke Marshall who made his international debut on Saturday. Surgery on his ACL is likely to sideline Wallace through the summer, and could spell the end of his international career. The 33-year-old’s last appearance for Ireland came in the 60-0 defeat to New Zealand in Hamilton after he was called to the squad from his holidays to replace the injured Gordon D’Arcy. VIDEO: Ruben Wiki loves tackling streakers, LOVES IT! Email “Another one bites the dust: Knee injury rules Wallace out for rest of season”. Feedback on “Another one bites the dust: Knee injury rules Wallace out for rest of season”.